Try Continuous Ink System with your Brother MFC-6890CDW and make 30 times more quality prints for the same money! Pay only 0.04 USD for A-4 full color print! ciss brother mfc-6890cdw (or continuous ink supply system) consists of three main elements: cartridges, reservoirs of the system itself and a loop. In order to answer the question, what the CISS for mfc-6890cdw is, it should be mentioned, that the construction of the system was designed in such a manner, that the productivity of the device will not suffer. The installation of the bulk ink system for brother mfc-6890cdw takes 15 minutes at most, independently of the kind of the device (if it is a printer or a multifunctional device). This process will not affect the interior structure of the printing device. But as a result the device with the continuous ink supply system will provide you with steady operations without failures. The dye runs from the reservoir (during printing process via multichannel loop) to the each cartridge of the device, and after that to the printing head. Each reservoir of ciss for brother mfc-6890cdw contains at least 100 ml of dye. It is enough to refill the continuous ink supply system once to print more than 2500 photos! It is easy and simple to use CISS. Now, you don't have to mess about with cartridge replacement. Your printer will not require ink refilling for several months of intense operation! The ink supply system ciss mfc-6890cdw is perfect for printing of great amount of qualitative and inexpensive photos and texts. It could be used almost with all the models of inkjet printers with built-in printing head, because the resource of such a head is almost unlimited. Almost all the models of Brother inkjet printers meet these requirements. They are comparable with such models of CISS as ciss for brother mfc-5890cn and ciss for brother mfc-j6710dw. By using cis brother mfc-6890cdw you will get an extra stability of printing process. Now you don't have to take out the cartridge for refilling or chip resetting, and at that you will prevent air penetration to the printing head or ink leaking. If you install and refill the system, you will have just to add ink to the donor tanks. And above all, due to ciss ink system brother mfc-6890cdw you will achieve the highest savings ratio, because you don't have to purchase expansive original cartridges. 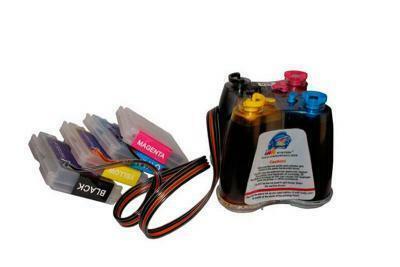 The capacity of ink donor tanks exceeds the cartridge volume by 5 times at the average, and their price is lower. Furthermore, the possibility of using comparable paper will allow you to minimize expenses on consumable materials.